On the Beaten Track: Thailand – Jet. Set. Jeanne! Admittedly, I exhibit elitist tendencies when it comes to my passions (food, philosophy, travel, climbing, languages – though oddly enough, I’m not a wine snob). And so I was rather disappointed when my decade-long-overdue-big-backpacking-trip to Thailand was met with hoards of ballerman-esque resortists on the beaches of Railay and Phuket and peppered with a bad taste of manufacturedism in the form of touts and tourists galore. Ick. I suppose it was to be expected. After all, it is the high season and The Beach was released 12 years ago (although I prefer to blame the übercommercialization of Thailand on that stupid face tattoo film). I prefer my travel more wild, sans tropical cocktails donning mini umbrellas. I construct my itineraries out of fragments of passions, activities and landscapes rather than out of a box. I prefer public transportation to cruise ships, mountains over Mai Tais, navigating solo and losing oneself in a strange, gritty city to being greeted by hand-written airport signage (unless my boyfriend is the one holding the sign). Even the most stunning beach (Ko Phi Phi, I’m looking at you) is just ubiquity when packed with the οἱ πολλοί, hoi polloi. That being said, I enjoyed my time in Thailand, spent mostly climbing beautiful limestone and indulging in market, mall, and stall shopping and chowing in Bangkok (before Tonsai Tummy kicked in). Good times. So while I didn’t fall in love with you (as I did with Argentina, Peru, South Africa, Kenya), I enjoyed my time in your big, bad metropolis, the jungles, seas, and dramatic cliffs of your Andaman coast. And most of all, I enjoyed making some new friends along the way. yeah, i did (climb up & then jump off 15 meters into thai turquoise seas)! interesting write-up. I didn’t do Phuket in my 5 weeks in Thailand, so I can’t speak to there. But, I think you might have left w a better impression of the country, based upon what you wrote, if you had been able to go to other parts of the country north and east and not in high season. I’m unemployed starting in November. Maybe you can give me an idea for a foreign trip. fair enough. 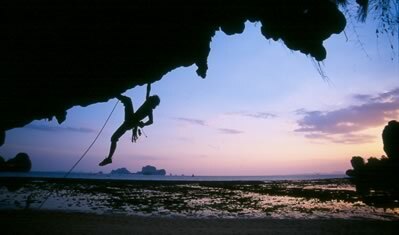 i think that chiang mai would’ve been more up my alley travel-wise, but thailand was a climbing-focused trip for me. it would have been great to see both the north and south, but not really feasible in ten days time. oh well, maybe next time. my next asia trip will be to vietnam, i reckon. or malaysia truly asia. as for you, i highly recommend south america in november, buenos aires is beautiful that time of year.